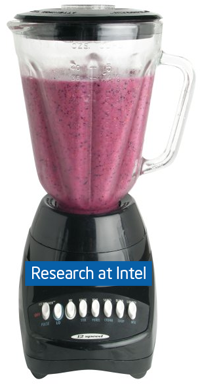 Intel is releasing into public beta today a new “experimental” product from its labs called Mash Maker. It’s a browser plugin – most functional with Firefox but also available for Internet Explorer – that lets end user create their own mashups on top of existing websites. The idea of a mashup, while very central to the movement we call Web 2.0, has always struck me as an overly techie concept. And Intel’s Mash Maker doesn’t do much to change that, even though it tries to bring mashups more mainstream. What’s a mashup? Simply a combination of data from disparate sources into one presentation. Web 2.0 sites mash up data all the time without asking their users to do much. Problems only seem to arise when when users are required to link data together in manual, custom ways. Intel Mash Maker sits in your browser as a toolbar that can be expanded into a sidebar as well. As you browse the web, you’ll come across sites for which it already has mashups available. 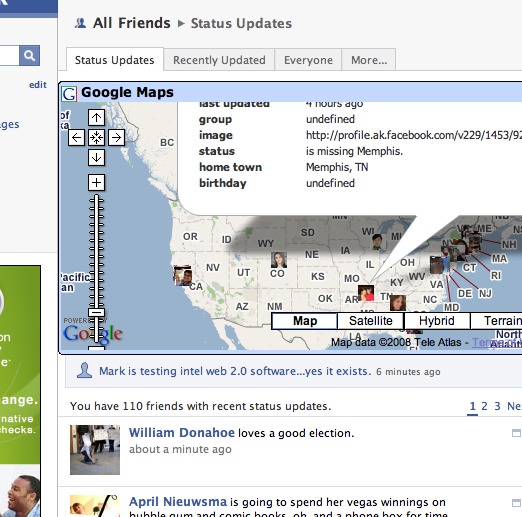 For example, if you go to your friends page on Facebook, it will suggest that you activate a mashup that shows all your friends’ avatars on a Google Map. If you agree, it will plop this map right onto the webpage, and you can even decide to pin the map to the page for future visits. This is the easy part of Mash Maker, and it’s kind of nifty. There are other places on the web where Intel likes to highlight its mashups, such as Expedia where a “leg room” mashup will show you how much estimated leg room you’d have on each search results flight. You can also pull up Yelp reviews when flipping through Craigslist. But much of the web is like the Wild West and there are no premade mashups yet. That’s where presumably you are expected to come up with your own. And Intel has provided all the options you need to make a mashup from right within the browser extension. But honestly, the vast majority of users are going to have no clue or desire to learn how to make mashups with it. This is where the idea of an end user mashup program falls short, and it’s same the reason you’ll never hear your (normal) friends mention how they stayed up all night playing with Yahoo Pipes. When it comes down to it, it’s probably not terribly important that Mash Maker will have limited appeal. I still can’t quite figure out why Intel even decided to produce something like this, since they seldom (never?) release pure web products that have nothing to do with hardware. But hey, why not – I’m sure at least a few people will get a kick out of it.